Eagle-eyed users of Android O will have noticed the absence of the 'Allow unknown sources' setting, which has existed since the earliest days of Android to facilitate the installation of apps from outside of Google Play and other preloaded stores. 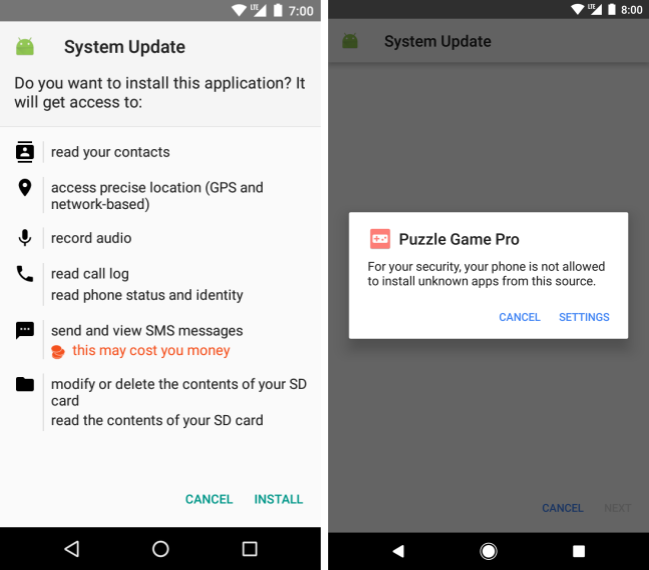 In this post we'll talk about the new Install unknown apps permission and the security benefits it brings for both Android users and developers. Earlier this year we introduced Google Play Protect - comprehensive security services that are always at work to protect your device from harm. Google Play continues to be one of the safest places for Android users to download their apps, with the majority of Potentially Harmful Apps (PHAs) originating from third-party sources. A common strategy employed by PHA authors is to deliver their apps via a hostile downloader. For example, a gaming app might not contain malicious code but instead might notify the user to install a PHA that masquerades as an important security update. (You can read more about hostile downloaders in the Android Security 2016 Year in Review). Users who have enabled the installation of apps from unknown sources leave themselves vulnerable to this deceptive behavior. Left (pre-Android O): The install screen for a PHA masquerading as a system update. Right (Android O): Before the PHA is installed, the user must first grant permission to the app that triggered the install. 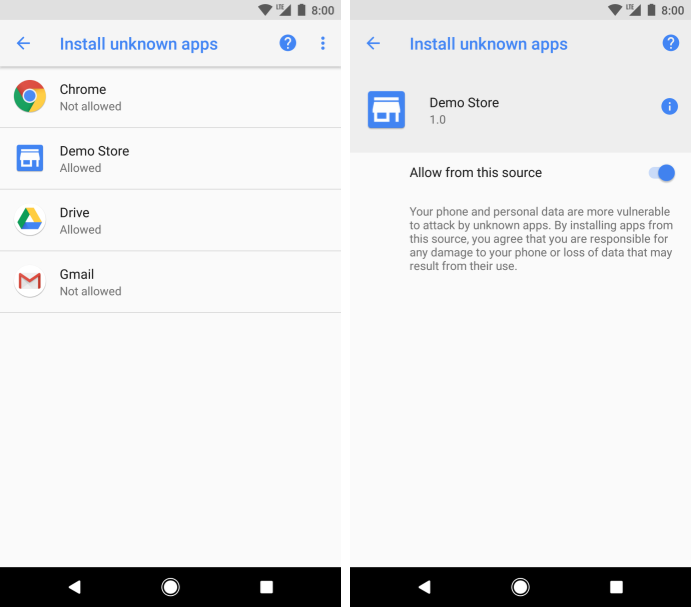 In Android O, the Install unknown apps permission makes it safer to install apps from unknown sources. This permission is tied to the app that prompts the install— just like other runtime permissions—and ensures that the user grants permission to use the install source before it can prompt the user to install an app. When used on a device running Android O and higher, hostile downloaders cannot trick the user into installing an app without having first been given the go-ahead. This new permission provides users with transparency, control, and a streamlined process to enable installs from trusted sources. The Settings app shows the list of apps that the user has approved for installing unknown apps. Users can revoke the permission for a particular app at any time. At any time, users can review the apps that they've allowed for installing unknown apps. To make the permission-granting process easier, app developers can choose to direct users to their permission screen as part of the setup flow. Apps that haven't declared this permission cannot install other apps, a handy security protection for apps that have no intention of doing so. You can choose to pre-emptively direct your users to the Install unknown apps permission screen using the ACTION_MANAGE_UNKNOWN_APP_SOURCES Intent action. You can also query the state of this permission using the PackageManager canRequestPackageInstalls() API. Remember that Play policies still apply to apps distributed on Google Play if those apps can install and update other apps. In the majority of cases, such behavior is inappropriate; you should instead provide a deep link to the app's listing on the Play Store. Be sure to check out the updated publishing guide that provides more information about installing unknown apps, and stay tuned for more posts on security hardening in Android O.